This pump is mechanically operated with steam or compressed and does not require electricity. Effective at eliminating pooled condensate from inside equipment. 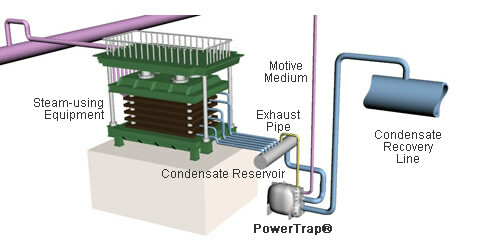 The PowerTrap® is capable of discharging condensate under conditions in which a steam trap alone would not suffice. Suitable for use on closed systems* for the complete recovery of condensate heat and water from steam-using equipment. Built-in trap allows for use on applications where pressures fluctuate from vacuum pressures to positive pressures. When the GT inlet pressure is greater than back pressure, the GT acts as a steam trap, continuously discharging condensate. When the GT inlet pressure is less than back pressure, the GT acts as a mechanical pump, forcing out the condensate. Automatically switches between pump and trap operation, with no need for steam trap sizing. Unique snap-action mechanism instantaneously opens or closes motive medium inlet and exhaust valves. This prevents leakage of the motive medium and valve / valve seat erosion that tends to occur with crank mechanism pumps. No need to detach from piping to perform maintenance. Fast and easy cleaning of intake valve, which is prone to scale build up, by simply opening a plug to remove (GT10). Newly-developed high-capacity CK3MG and CKF3MG check valves (CKF3MG for flanged GT10). As it contains a steam trap, one PowerTrap® system should be used for each area where there is steam-using equipment.